Submit Response is a weblog by Jack Mottram, a journalist who lives in Glasgow, Scotland. There are 1308 posts in the archives. You can subscribe to a feed. This post was made on and belongs in the radio category. 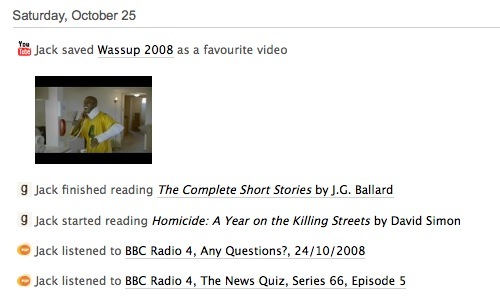 The previous post was Today’s Links (22/10/08), and the next post is Today’s Links (26/10/08). As you’d expect, it’s a profile for Action Streams that will add the radio programmes you ‘pop’ to your ‘lifestream’. Then you’ll need to activate the profile in the usual way, by logging into Movable Type, navigating to the Other Profiles section, clicking ‘Add Profile’ and choosing ‘Radio Pop’ from the drop-down menu. All this messy editing business isn’t ideal, but I couldn’t work out how to get the profile to ask for your Radio Pop username when you activate it, then configure itself accordingly. If I do get around to making a cleverer version, I’ll update this page straight away. Posted at 3pm on 25/10/08 by Jack Mottram to the radio category. I know of one other person that uses both - me! i have never wondered what you were wittering about but was pretty confident that if there was anyone out there he/she would be a submit response afficianado. can we go back to collapsed lungs and football casuals? Lepatron - oh dear, the post I’m writing up at the moment is mostly about getting a Huawei E172 modem to run under Ubuntu on an Eee PC (with a brief foray into the relative benefits of wicd and network-manager). I am wearing my Tranmere badge while writing it, though! Also, without the space in your username, you look like some sort of futuristic leopard robot! Hah. I actually quite like listening to Any Questions/Answers, in a shouting at the radio way. I even listen to You and Yours sometimes. Is there an emoticon for ‘hangs head in shame’?